The sun rises oozing with heat at temperatures between 32C and 36C. People living in non-air conditioned houses and those working in a non-air conditioned environment sweat it out the whole day. Young and old both long to have a deep plunge in some refreshing water to cool themselves off. People with lots of money to spend go to new-found nook and crannies, beautiful beaches and resorts with the family, friends, and officemates for bonding time. But locals in the Zamboanga Peninsula need not go far. Thanks to Mother Nature for giving us Lakewood. Lakewood was named after Lake Wood, a large lake intersecting the town. The most popular species of fish in the province can only be caught in the lake: the `carpa and porang. Lakewood is about 42 kilometers away from Pagadian City along the Zamboanga City - Pagadian City highway. Geographically, it is 7 degrees, 49' 60" north and 123 degrees, 9' 0" south. From Pagadian, vans leave every hour for Lakewood. While public buses pass through the Lakewood junction along the National Highway, the Alindahaw Lakeview Resort and the town proper are still several kilometers inside. It's best to take vans or hire a habal-habal when you get off at the junction. Or better yet, hire a private. The Subanen tribe is the major ethnic group living around Lakewood and Zamboanga del Sur. They cultivate vegetables and corn for their own use. Subanens have their own dialect, but they also speak Cebuano as a common dialect for conversation. They take pride in their rich heritage which they preserve and promote through the Melengas Dance Ensemble, that gracefully presents lovely Subanen and Moro dances. Upon arrangement with Alindahaw Resort management, they do a cultural presentation to wow guests. 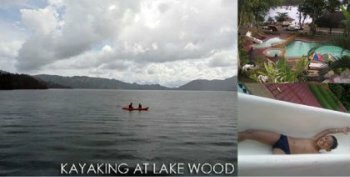 Alindahaw's main attraction is the amazing stillness of the mystic 800 hectares of water named Lake Wood. Sometimes it is referred to as Lake Lakewood. The best place to enjoy the view of Lake Wood is at the Alindahaw Lakeview Resort in Brgy. Biswangan. The resort has accommodations and kayaks for those who want to row around and many swimming pools of warying widths and depths to choose from. Travel Mistress posted in Multiply some photos she had from Alindahaw Lakewood Resort. She said she had a quick visit to check it out and found that "it surprisingly had a modern facade with a clean and pristine lake."